Songkran Water Festival is the largest celebrated festival in Thailand, and it is held between 13th and 15th April every year. It is also the most anticipated and most extended holiday in the country. During this time, Thais who work in big cities such as Bangkok visit their families who live in small towns to celebrate the event. 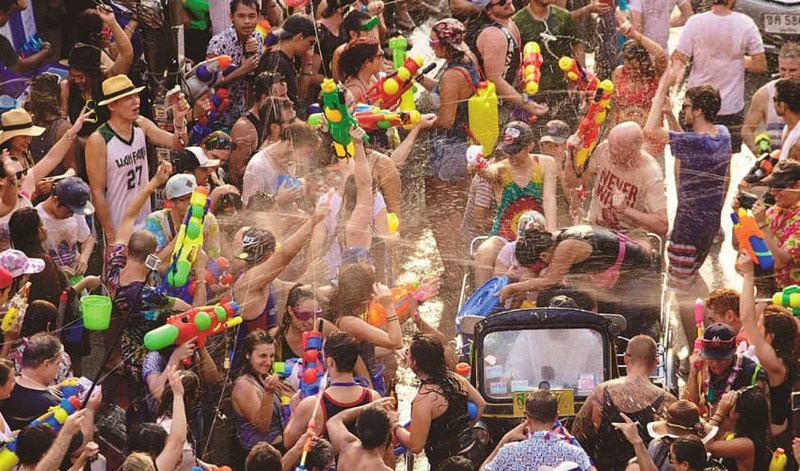 The Thai New Year is a spectacular event that has both energetic and reserved locals filled with incredible energy standing in the streets with buckets of water and water pistols ready to splash passersby and each other with water. Brahmins from India started the tradition with the belief that the sun passes into Aries that is now deemed as the ancient Thai New Year’s Day called ‘Wan Payawan’ and is held on April 15th. It is not just a water battle for people of all ages. The water sprinkling is a symbol of wishes and blessings. Additionally, they remove all the possessions that had bad luck the past year and establish New Year resolutions. The word ‘Songkran’ originates from Sanskrit to mean moving forward. In addition to being celebrated in Thailand, the festival is also held in Cambodia, Burma, and Laos. Thapae Gate is a primary entrance into the Old City of Chiang Mai, and the area is full of revellers. The massive water battle consists of both foreigners and locals, and you have to see it to believe it. You will find ladies and gentlemen, women and children, and even the young and the elderly getting themselves wet in this exciting water fight. Big stages are organised with a variety of competitions and performances, and you will witness multiple people with traditional Thai costumes. You will encounter foam machines, but minimal drinking since it faces strict limitations in this place. Near the moat, there is a lengthy road stretch that is filled with lots of laughter and numerous water fights. Be keen to prevent water from getting into your mouth, ears, and eyes since the water being splashed has been fetched from the moat, which might not be clean. You will enjoy Thai music from the local bands who will be playing in the scene. Additionally, you will get to buy local clothes, souvenirs, and various street foods from sellers who will fill the area with goods. Nimmanhaemin Road, also called Nimman Road, is one of the trendiest and most modern areas in Chiang Mai with shops and boutique hotels. The streets are filled with numerous water battles, and you will enjoy plenty of entertainment as performers and DJs entertain the masses at the entrance of the Maya mall. People stand at the entrance of their houses with large tubs of cold water and hoses, waiting for their victims to walk past. Leaving the crowded places of the towns and looking to explore the smaller streets can result in plenty of interactions with the locals with numerous friendly soakings. As a mark of the Thai New Year, the festival is a period for people to seek blessings and make merit. You will get to see monks wearing saffron robes in the morning as they walk out for a collection of alms. There are many merit makers and many monks over the festival, and you can rise to see the beautiful line of monks strolling the streets. Sacred Buddha statues are released from numerous temples in Chiang Mai and paraded through the roads. The images are stunning, and they get spectacular as you see them en mass. Buddhists sprinkle some water on the statues as a symbol of respect and cleansing, as they hope for prosperity and luck for the coming year. More joy is added to the colourful procession by musicians and dancers. If you don’t like walking, take a tuk-tuk to experience the festival on Chiang Mai’s streets. Even in a tuk-tuk, you will not miss the fun as you will still get wet. The small vehicle will allow you to go to more places and enjoy plenty of water battles. Numerous Thais get into a pickup truck’s back with barrels of water, water guns, and buckets to cover more ground. Thai people go to temples to perform some rituals, offer donations, and pray. Chiang Mai has many attractive and historic temples for your pick. You will witness Buddha statues being sprinkled and washed with water as well as people carrying buckets of dirt to these temples as a symbol of colourful flags and the earth that was carried away on the feet of the locals over the past year. 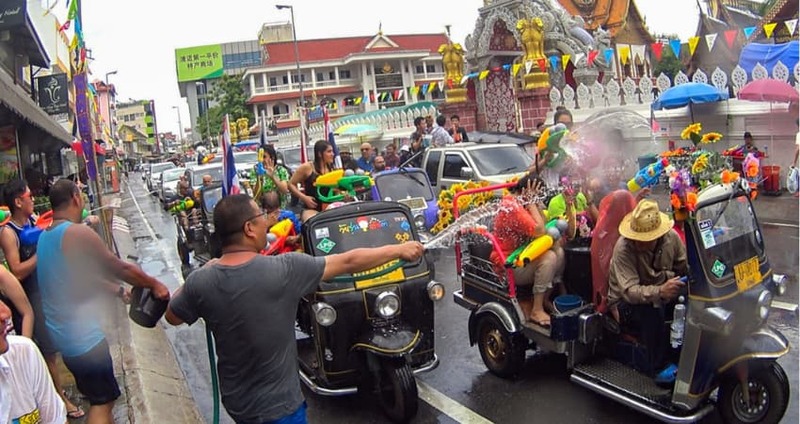 Emotions are high during the Songkran, and no one wants the fun to halt. As the sun sets, energetic tourists and locals fill the local bars to have a great time and party. You are guaranteed to have a lot of fun, drink, chat, and dance. This festival will have you soaking wet as you participate in water fights. In case you go to the moat area, you will be splashed with water from the stream, and you will need to have worn clothes that cannot be ruined. Shoes are also essential to consider. Therefore, consider picking sandals, particularly old ones. Wearing your best sandals will disappoint you since they will ruin after walking in puddles for three days. But avoid flip flops since you might hurt yourself as your feet slide on their surface. Riding a scooter is a bad idea since you might get splashed with cold water as you ride in the streets. It’s best to leave the scooter and ride in a tuk-tuk. These small vehicles are more fun since you can splash other people with freezing water as you drive via the streets. It is also ideal to take a Songthaew. However, be careful at traffic stops, you will get ambushed. However, the best fun is gotten by walking the streets. You can pay the local transport to take you to the celebration spots where you can walk around the town. Please keep in mind that Chiang Mai is a big city and you could get exhausted. Restaurants and bars are opened normally, and you can relax there. When you are in places like the moat, it is best to shut your mouth to prevent dirty water from getting into your mouth. Swallowing the dirty water might make you sick. You don’t want to miss the rest of the festival. There are numerous tiny stalls in the streets, selling alcohol like beer and you might be tempted to go on a drinking spree. The weather here is scorching, and you might be walking the whole day, and excessive drinking will not help. Drink responsibly! This aspect is very significant because the people of Thailand are tolerant and friendly to tourists who come to have fun. But be mindful of their traditions and culture. Remember to avoid splashing water on the elderly, parents with infants, and monks. Avoid disrespecting images of Buddha and portraits of kings. In case you witness a religious procession, allow it to pass. You are allowed to splash water on people from morning to evening. So don’t get carried away and splash water on people past 6:00 pm.